The Book of Whispers is the story of a young man’s courageous battle with bipolar disorder. It was a battle he lost. But not without a fight. Jake McClain Driver was a talented, passionate, brilliant young man with a tortured mind. His creativity and wit were astonishing. He was a gifted writer and played amazing guitar. He wrote songs and poetry, painted, drew and made pieces of art. He had a great sense of humour, an innate ability to connect with others, and as a result, he loved and was loved. Jake also had an illness. One moment he was sweet, loving and engaging. In the next, he was agitated, erratic and disruptive. He worked hard to overcome his problems. He went to doctors who prescribed treatment plans involving medications and therapy. He was hospitalised multiple times. He was shot by a police officer. He served time in jail. Finally, at age 26, he took his own life. 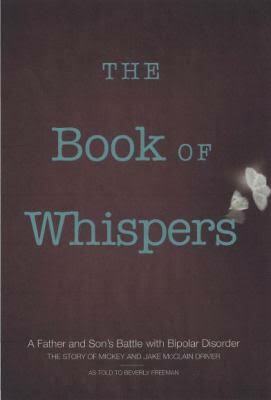 Among Jake’s creative work was a series of poems he called The Book of Whispers. No one knows why he gave his book of poetry that name, however, those of us who were close to Jake believe his verses may have been whispers to him that helped silence or quiet the chaos in his head that he experienced with his disease. Through his poetry Jake weaves his own personal experience as he battles demons and pain that might seem unfathomable to others. Some of the verses are whimsical and downright funny. Others are thought provoking. A few are sad. In preparing to publish Jake’s book, the goal was simply to share his poetry with others. As the project progressed, we came to understand that his poetry is more meaningful when read within the context of Jake’s all-too-short life. We hope that Jake’s story makes a difference to others. If even one person who is experiencing the ravages of mental illness – their own or that of a loved one – is helped by hearing about Jake’s journey or by reading his poetry, the effort to publish it will have been worth it. As an update, we received an email from Jake’s father Mickey and we would like to share this as an example of the global problem concerning mental health. Hello Phil. First, we are so sorry for your family’s loss of Lee. You and your family, and Lee, are in our prayers, and our hearts go out to you. It has been said that there is no greater loss in the world that the loss of a child. We are thinking of you and your journey ahead. Thank you for your note and for ordering our book. We have looked at your wonderful website honoring Lee. Your efforts to remember him and providing valuable information on mental health issues is highly commendable. Your son looks a lot like our son Jake, especially the picture/video of him playing guitar. After reading information on your website about mental health services where you live we were amazed at the similarities to where we live. In Houston, Texas USA we have a city jail with over 10,000 inmates. It is also considered the largest mental health facility in the state. Thanks for the information you have on your website about our book. The book was our tribute to our son and a bit of a legacy for him. Like your website, the book provides information on mental health issues and experiences. Our book also has a Facebook page with 9,500 likes www.facebook.com/thebookofwhispers. We will reference your website in our communications and we know that it will help people who are seeking information and direction on mental health issues. Thanks for what you have done to help others. God bless.